If you think about wine, what comes to your mind? The sweet fruity fresh red grape from Napa? That dry smooth flowery wine from the romantic region of Tuscany? Or maybe that oaky, sophisticated French wine that you wish to pair with a sumptuous medium rare steak or strong cheese? If you think about wine, would you think of South Africa? I am going to explain you, why you should say –Yes! The wine-making tradition in South Africa started over 350 years ago. Today there are over 247,000 acres of vineyards making the region the 9th largest producer of wine in the world. The first vines were planted by the second group of immigrants to the Cape, The French Huguenots, who brought vine cuttings with them from Europe. Their traditions live on in the lovely Franschhoek Valley, 40 miles east of Cape Town, where the wine makers call themselves vignerons and wineries bear names like Clos Cabriere, La Motte and Haute Provence. 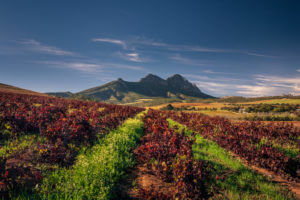 Despite its African geography, the Cape winelands, situated at the Southernmost tip of Africa just 45 minutes from Cape Town, enjoy a Mediterranean climate with cool, wet winters and warm dry summers. The mountain slopes and valleys form the ideal habitat for the wine grape, Vitis Vinifera, and the sea breezes from the Atlantic and Indian oceans cool the vineyards during the warm summer afternoons, slowing the ripening process and creating an intense fruit flavors. The top five grape varieties in South Africa are Chenin Blanc, Cabernet Sauvignon, Colombard, Shiraz and Sauvignon Blanc. Approachable. Diverse. Delicious. 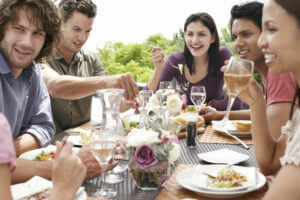 South Africa’s wines are characterized by a down-to-earth friendliness., fun to pair with hearty meals. Bursting with notes of lemon and pear, Protea’s Chenin Blanc is a slightly dry white wine. Seafood is a natural pairing. For a cheese pairing, Humboldt Fog’s slight tang and mild creaminess allows the wine’s citrus notes to come forward in the finish. The Sauvignon Blanc from Indaba features grapefruit, citrus and tropical notes that move to a grassy mineral-tinged finish. Silky and dark with notes of pepper and blackberry, Wolftrap Syrah Mourvedre Viognier shows the depth of a great South African red wine. The Cabernet Sauvignon, from esteemed South African winery Robertson, displays its varietal characteristics of mulberry, plum and cassis, giving way to a lingering finish. Flagstone’s Dragon Tree is a South African red to be reckoned with notes of dark cherry, cigar box and the slightest hint of mint followed by fruit in the sweetly spicy finish. South Africa produces Methode Cap Classique (MCC), a type of sparkling wine that’s made according to the traditional Champagne method (but is often far less expensive as you’re not paying for the Champagne, France, provenance). The region produces exceptional MCCs, but one of the best (and newest) bubblies to try is the Babylonstoren Sprankel MCC. There’s also Pinotage, a red wine completely unique to South Africa and made from a grape that is a hybrid of Cinsaut and Pinot Noir. For a sommelier-approved bottle, sample the Kanonkop Pinotage. If you’re after a good entry-level wine, the Beyerskloof Pinotage is always a crowd-pleaser. So.. If say you wine..Would you think of South Africa now? South Africa is the true Wine Land.